Bing has announced an array of new “intelligent search” features around hotel searches, home cost and pricing guides and also coupon and deal snippets in search. Bing said it hopes these features let searchers save money and make better decisions when booking a hotel, hiring a contractor for their home or finding good deals online. Plus Bing has this massive comparison view that provides a comprehensive overview of pricing by hotel option. 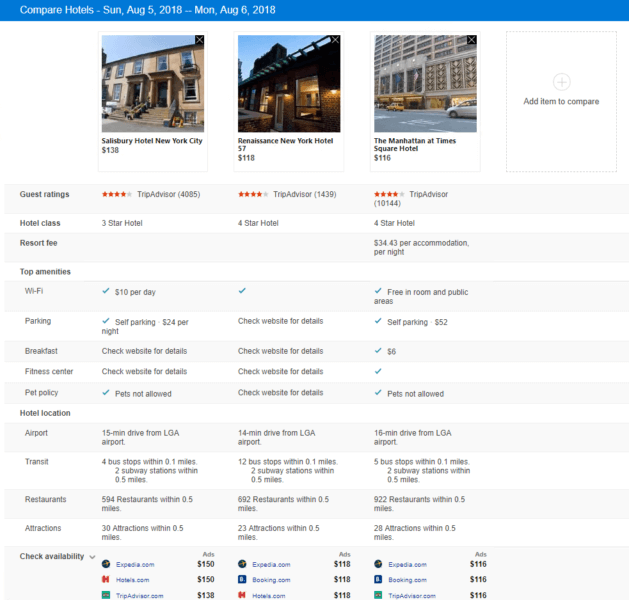 It shows hotels in a grid with their price, ratings, class level, amenities and more. What if you needed to fix something in your home? Build a fence around the property to keep out those pesky neighbor kids? Paint a bedroom or fix a broken leaky faucet? Bing can help you with that too! Bing said they can show you “cost ranges to provide transparency for home services like sink installation costs and toilet repairs.” They get the data from Porch, a home service provider portal. Then, after you find out how much it should cost, Bing will let you find local businesses using Yelp to request a quote from several of those vendors.